Do we know the causes of ADD ADHD? We know that our brain circuitry and functioning and neurochemistry is different. Presumably, that comes from our genes (ADD ADHD tends to run in families, especially among males). We have a lot of new information about epigenetics,which shows that it’s not just the genes we’re born with, but also how they’re regulated, turned on and off and when and how much. This tends to be the result of environmental factors, such as trauma and stress, for example. Such factors possibly could include diet or exposure to toxins. One of the models for many psychiatric and medical illnesses is that a person’s genes may make them prone to have the illness, but whether or not it develops depends on their environmental experiences. Well, yes and no. I think the information above is fairly accurate, but we have not yet pinned down specific genes or other specific factors, though there are some known correlations (see the links below). Hopefully, some of you who are more scientifically astute and informed than me will make comments about this and try to correct some of my misconceptions. This entry was posted in add, adhd, science and tagged ADD, ADD cause, ADD information, ADD science, ADHD, ADHD cause, adhd information, adhd science, attention deficit. Bookmark the permalink. brain. We exhibit these behaviors but we do not know why. We don’t know why because it is our unconscious mind influencing our conscious behavior. This also answers the Riddle ” Why does giving a Stimulant medication to (what appears to be) a over-stimulated Child or Adult, Calm them down”? Answer: Because we are temporally taking over chemically what our brain was doing behaviorally. 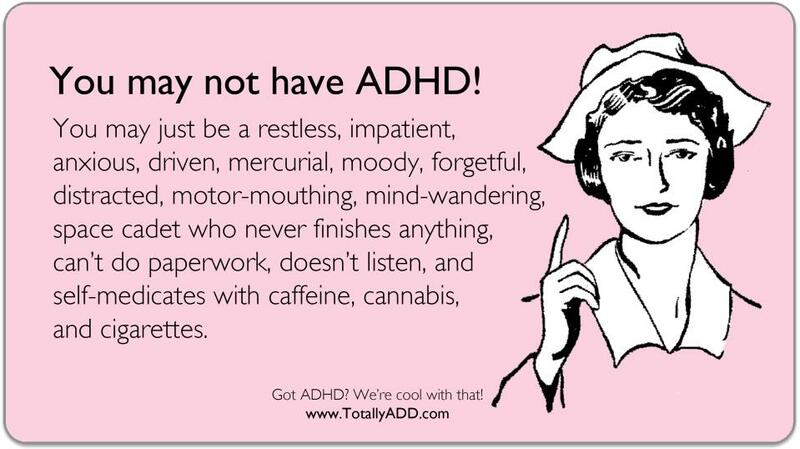 do you have more info about what the stimulants do to people without ADD ADHD? chet – very interesting, but a little over my head I’m afraid. given your hypothesis, wouldn’t the resultant effects constitute ADHD? Attention Deficit Hyperactive Disorder (ADHD) as defined by the Diagnostic and Statistical Manual (DSM) is not a Disorder, but only a mirror image of a Disorder. The behavior, as described by the DSM, is actually a very ordered response initiated by Primordial/Autonomic Emotion to restore Dopamine (DA) homeostasis in the sensory areas of the brain. Abnormally low dopamine levels in the sensory areas of the brain degrades our most primitive survival capability; the fight or flight response. The autonomic nervous system (ANS), sensing a threat to survival, initiates, supports and remembers unconscious behaviors that increase dopamine levels. Emotions that cause an increase of DA (or DA derivatives) in the sensory areas are fear and stress. Therefore, the unconscious behaviors supported by the ANS cause the individual (child or adult) to exhibit behaviors that are risky and socially unacceptable and have the appearance of a Disorder. The real object (problem) in this Mirror Image Hypothesis is unbalanced attention. Involuntary attention (external stimuli) has overwhelmed Voluntary attention (memory recall) leaving a DA deficit in the sensory areas, which causes the homeostasis restoration process to begin. Processing external stimuli into long term memory depletes the sensory system of DA. Memory recall replenishes DA into the system. Behavior modification techniques can be used to bring the sensory system into balance (homeostasis). Co-morbid low DA disorders would also benefit from a sensory system in homeostasis. are having trouble adapting to this powerful demand on their attention.